Cape Hachiman Park(八幡岬公園) is located Katsuura City, Chiba peninsula. It is face pacific ocean. There is observatory that you can enjoy great view of pacific ocean. There are also kids' facilities. This cape is also the ruins of Katsuura Castle. 1. use JR Sotobo Line to Katsuura. Katsuura Castle was built in the middle of 16th century by Masaki Tokitada, and abandoned in 1590 by Tokugawa Ieyasu. 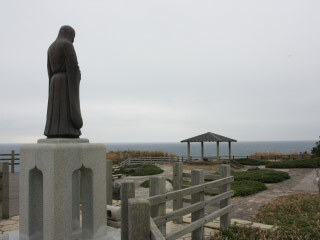 There is a statue of O-man no kata, Yojuin. She was the princess of this castle and became the mistress of Tokugawa Ieyasu. She was mother of Tokugawa Yorinobu, the first lord of Kishu Tokugawa, and Yorifusa, the lord of Mito Tokugawa. There are Kids' facilities in this park.